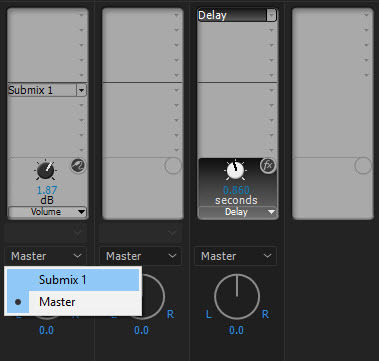 While I don’t intend to make these blog posts into advanced audio tips and tricks, Premiere Pro does offer the ability to create and use Submixes inside the Audio Track Mixer which is right under the channel effects – see the last post. 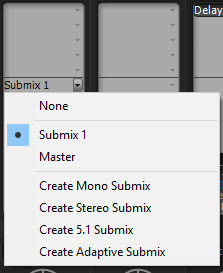 When you select a Submix slot in Premiere Pro, it allows you to create a submix that is suitable for the project you are working on – so mono, stereo, 5.1 and adaptive, which means lots of tracks, but is for more specialist workflows. 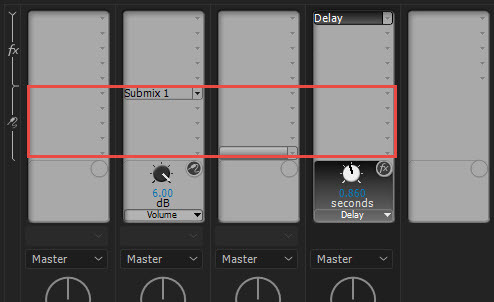 Without wanting to go into too much detail, a submix allows you to send the output of your chosen channel into another channel (the Submix). This can then have additional effects applied, before finally being mixed together with everything else through the Master Channel (the final output). 1) You send a whole series of different audio channels to a Submix and apply an effect to the submix. This in turn makes sure that all the channels sent to that submix have exactly the same settings applied to them from that effect. This method ensures an equal treatment for all your channels in one simple step. In part 2, I will discuss the second way to use Submixes in Premiere Pro. Be sure to check out our Premiere Pro tutorials here. If you’d like to learn more, check out Larry Jordan’s extensive training here or sign up today for a membership for on-demand video editing courses.